Varicose veins are enlarged and twisted veins close to the surface of the skin that commonly occur in the legs and ankles. They are usually dark blue in appearance, and are often accompanied by itchiness, swelling in the feet and ankles, and leg pain. These symptoms can get worse after standing for an extended period of time. More serious symptoms include open sores that can bleed after minor bumps, as well as scaling or thinning skin. However, some individuals don't experience any of the above painful symptoms, and instead only experience the visual symptoms consisting of the blue and swollen veins. The veins in our legs contain valves that normally help blood flow upward from our legs to our heart. Varicose veins occur when these valves stop working as efficiently as they should, resulting in blood that collects and builds pressure in our legs. This leads to the swollen and twisted appearance that we commonly associate with this condition. Varicose veins usually run in the family, and they tend to occur as people age. Pregnancy or being overweight are also common causes of varicose veins. Individuals that have jobs where they are standing for extended periods of time are also more prone to developing this condition. While varicose veins are not usually a sign of a serious problem, they can occasionally signify a condition known as "deep vein thrombosis", which is a form of vein blockage. If you experience significant pain in your legs as a result of varicose veins, consult your doctor to make sure there isn't a more serious underlying problem. In most cases, home remedies can usually help manage the symptoms of varicose veins as well as reducing the swollen blue appearance. Horse Chestnut is known to improve blood circulation as well as strengthen the walls of blood vessels. Therefore it is not surprising that it is a common natural treatment for varicose and spider veins. 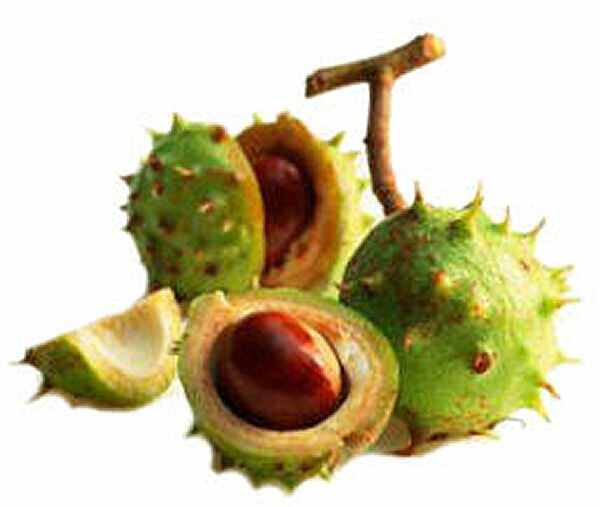 A simple remedy is to take 300mg of horse chestnut extract two times per day. NOTE: Never consume horse chestnut seeds in their raw or unprocessed form as they are toxic. Only take supplements that are derived from horse chestnut extract. An alternative is to apply horse chestnut oil directly onto the affected area each night. Do not massage the oil into the skin, but instead simply apply it to the area and leave it overnight. If you experience any extreme itchiness, discontinue use and consult your doctor before continuing. Avoid horse chestnut if you are currently taking any other blood-thinning medications, if you have kidney or liver problems, or if you are pregnant or breast feeding. Grape Seed Oil is known as an excellent natural remedy for a number of skin conditions, including varicose veins. It is particularly high in Vitamin E, linoleic acid, and an anti-oxidant known as oligomeric proanthocyanidin complex (OPC). These OPCs are known to strengthen blood vessels and increase the elasticity of capillary walls, as well as reduce inflammation. Therefore an effective remedy is to add 3 teaspoons of grape seed oil into a small bowl, and gently massage the oil onto your ankles, legs, and any other areas affected by varicose veins using upward strokes (from your feet to the top of your legs). Apple Cider Vinegar is known to improve blood circulation, which can help reduce the swelling associated with varicose veins. A simple remedy is to mix 2 teaspoons of apple cider vinegar into a glass of water, and drink this 2 times per day. If you don't like the taste of this vinegar you can instead add 2 teaspoons of apple cider vinegar into a small bowl, and then mix in your favorite skin lotion. You can then apply this onto the affected areas of your feet and legs, using gentle upward strokes. Repeat this twice per day. If you spend a significant amount of time per day on your feet, there is a higher chance of increased swelling of your varicose veins. If that is the case, an excellent remedy is to simply elevate your legs when you come home. Simply lie down on a bed or couch, and then place a number of pillows beneath the legs so that the legs are raised above the rest of the body. This allows gravity to help the blood in your legs flow back towards the heart, which can reduce the swollen appearance of varicose veins. One of the simplest natural treatments for varicose veins is to apply an ice pack over the swollen areas. The ice helps to constrict the blood vessels as well as reduce the swelling. An ice pack can be applied to the affected areas for 10 to 15 minutes, 3 times per day. Many pharmacies carry specialized stockings known as compression stockings, which are an excellent way to reduce the appearance of varicose veins. They work by applying pressure to the legs, which reduces the diameter of swollen veins, resulting in an increase in the velocity of blood flow. Avoid continuously sitting or standing for long periods of time. If your work doesn't allow this, try to at least walk, stretch, stand, or simply adjust the position of your legs every 30 minutes. Elevate your legs each night while you sleep. Exercise at least 3 times per week, and try to incorporate both cardiovascular exercises as well as strength training into your routine. This will help increase blood circulation, as well as help you lose weight which reduces strain on your legs and ankles. Eat balanced meals that include more fiber as well as fruits and vegetables that are rich in anti-oxidants. This will help improve blood flow. Leafy greens such as broccoli, kale, and spinach are a good choice, along with prunes, blueberries, and pomegranate. Don't smoke, since smoking reduces blood circulation. Avoid alcohol whenever possible, since alcohol dilates blood vessels which increases the swollen appearance of varicose veins. A wonderful oil that can treat arthritis, skin conditions, and hemorrhoids. The seeds of this plant are effective for treating spider veins, arthritis, and wrinkles. Varicose Veins. NYU Langone Medical Center. Retrieved June 1, 2014. T. Sano, E. Oda, T. Yamashita, et al. "Anti-thrombotic effect of proanthocyanidin, a purified ingredient of grape seed". Thrombosis Research, Volume 115, Issues 1-2, 2005, Pages 115-121. Hi, I'm Helen 29, recently been having a lot of pain and aches in my left leg and noticed at the back of my leg my veins are popping out and look blue. The doctor has said it's varicose veins which my mum and brother also have. He said nobody would operate unless I pay and that best is to not touch them at all and leave them alone. But the problem is I can't sleep with pains. I try to put my feet on pillows but it doesn't help. Is their anything I can do for a bit of relief in bed. I have a lot of health conditions and now this. After I gave birth to my second child, some varicose veins started to appear on my legs. So my mother, who also developed varicose veins recommended me Venorid treatment, and I'm amazed by the results! Also I’ve been exercising 4 days a week, this has also helped to reduce and prevent varicose veins. Varicose veins are not a major issue if treated timely. It may be painless and not look bad at early stages but could affect your confidence level later due to its ugly looks. So it is better to treat it before it's too late. This page describes varicose veins remedies very well. It will be very helpful to people having this annoying condition. Thanks for the valuable information. Many people think varicose veins are a disease, it's actually a symptom for a disease called Venous Insufficiency. Thank you so much, these tips will save my life. I am sedentary and have trouble losing weight. Hello, I am over 40 years and have been diagnosed with Varicocele (initially and confirmed). Upon searching the internet/You Tube on the topic, I made to understand that Horse Chestnut is an appropriate herbal treatment. Could you please help me out on how to go about using the Horse Chestnut and/or any other herb in treating it. I look forward to receiving your kind response. I remain grateful, Ba. I would like to say thanks for this website, its's really amazing information. My mother is suffering from varicose veins and I am sure all these tips will help my mother to some extent.